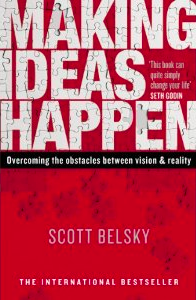 Just read the excellent ‘Making Ideas Happen: Overcoming the Obstacles Between Vision and Reality‘ by Scott Belsky, founder of the Behance network. You may know Behance from their excellent Action Method system and series of related notebooks, all of which – along with the book – are aimed towards helping people in creative industries be productive and get things done. Of course these days pretty much all of us work in creative industries if you’re not stuck in a McJob (in which case get out…). As the book’s title suggests, Belsky wants to help you get the genius creative thought in your head out into the real world where it can either flourish or fail – but at least it will be real. To make this happen he’s gone round asking a number of successful people in the sphere of creative execution as to what they’ve done just to make stuff happen. The book distils this down into easy to understand sections backed up with good real-life examples. Sometimes the world of domain names makes me pause. At the moment you can bid on the prime, top level domain Pizza.com (no link, it doesn’t need any help) over at Great Domains. There’s four days left on the bidding and currently it stands at $2,505,000 – yep, a smidge over $2.5 million. Nice. Where is this going to finish up? I reckon somewhere between $7-9million as it is the most amazing opportunity to own a the piece of internet real estate for a vertical that has regular repeat business in the millions each day. Hungry? Go to Pizza.com and order from your best local pizza place (or whichever local pizza place is paying the most to be there). Easy to remember. Does what it says on the can. The price will be driven up not only from entrepreneurs who can see the dollars (and pounds, and euros) just waiting to be earned, but also from the big pizza players wanting to expand their web footprint and save themselves some serious adword dollars. On that note, maybe Google should be trying to buy it themselves to ensure competitive adwords stay at top dollar for them, but I guess they can just cream the money from everyone else as they struggle to compete with the ‘go to’ direct navigation site for pizza. Now where did I put my wallet? Addendum: Pizza.com finally sold for $2.6 million, so my estimate was a little high! To be honest I feel like that is still somewhat of a bargain given the amount of pizza that is consumed globally every day. Today is Google’s ninth birthday – as witnessed by the cute pi&ntilda;ata in their home page logo*. So that means it’s been nine years since that clean, simple page with just a logo, a search box and a button appeared and changed the way the web worked. Again. I won’t rehash Google’s history, Wikipedia does the usual splendid job on that, suffice it to say they are still a great example, along with many others such as youTube & Facebook, that nothing is written in stone in this Internets business. That idea you just had may seem a little crazy/obvious/impossible to you right now, but in nine years time me and many others could be blogging about how your idea changed the world. Of course it won’t be ‘blogging’ then but memelizing…. coff. Excelsior! * And no. Nothing happens if you ‘hit’ the pi&ntilda;ata unfortunately..
Seth Godin has always been a fascinating guru in the realm of modern marketing and his presentation at TED is no exception to this rule. It is, Godin expounds his basic view of modern marketing: you have to be remarkable to succeed these days, not average – and being remarkable makes the right people notice you, who then tell their friends, who tell their friends and so on. Godin expounds that you focus your new idea towards the early adopters, the innovators – because they are the only people interested in truly new ideas – the average person is only excited by this week’s latest DVD on a normal day. In Japan they have the concept of an ‘otaku’, someone who would travel all the way across Japan purely to try out a new sushi restaurant. These are the people who should be your crusaders, telling all their friends about your new product because it is just the coolest thing. Design rules now: make your product fit consumer needs and be noticeable. Safe is risky: Be remarkable, be the purple cow in the field, take risks and find out what people like. Being very good is very boring. So follow those rules and buy Seth a pint when your next business makes a gazillion dollars.